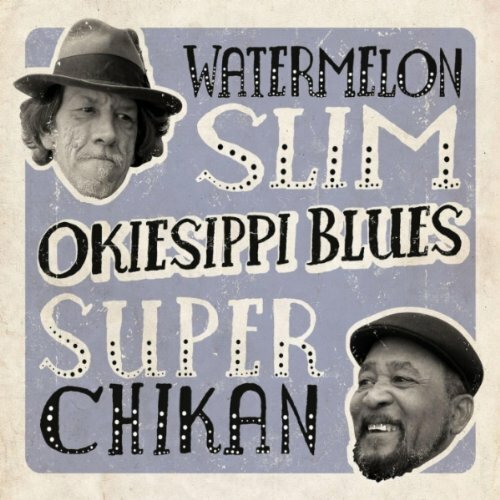 Two of the more celebrated bluesman of the 21st century, multiple Blues Music Award-winner Watermelon Slim and Super Chikan, have paired up for Okiesippi Blues, a record whose title pays homage to the respective home states of these two artists. Slim and Chikan are both idiosyncratic sorts, so the potential to amaze is balanced by the possibility of a train wreck. Instead we get another in the long line of stellar collaborations that does neither and the opener "Trucking Blues" demonstrates why. The dialog interspersed throughout the song quickly wears thin, leaving us with a repetitive guitar riff with a few nice harp figures from Slim. It's a three-minute idea allowed to stretch to five, filled with the language of truck driving. Things improve with "I Don't Wear No Sunglasses," a grumpy old man blues that fits with Slim's artistic persona. The razor wire slide guitar riffs that was so great on his first two NorthernBlues records (Watermelon Slim and The Wheel Man) is back and it's accented with some brief harp blasts. Slim preaches the gospel of no-frills blues, free of indulgent solos and posturing. It's crotchety but makes for a good tune. Slim offers up another winner with "Thou Art With Me," a brief, spiritual-tinged acoustic, country blues number with some stylish slide strumming. The other half of this duo, Super Chikan, is probably at his best on "You Might Know," which is a nice slice of sweet, down-home country blues with vintage harp blowing and acoustic strumming. The pairing works well on "I'm A Little Fish," a musical variation on Muddy Waters' "Rollin' & Tumblin'" that has Slim handling lead vocals punctuated by backing vocals by Chikan. The slide solo is brief but tasty. The cantankerous Slim cannot be bothered to be constrained by the conventions of actual "songs." It's not easy to make hollers and narrations set to music compelling. When Watermelon Slim writes a song and sings and plays it, his gifts are still considerable. He may be more fulfilled exploring these less fashionable pursuits, but that doesn't make them any more interesting for the listener. "Northwest Regional Blues" is a long, meandering, spoken word tale set to music. It's hard to imagine anyone listening to this one twice if they get all the way to the end of it. It's not a song. It's not even good storytelling. There is a lot of narration, not a lot of music. After decrying extraneous soloing, we're treated to an eight-minute jam featuring Slim and Chikan rocking their diddley bo. No, this is not a reference to a soon-to-be former Democratic congressman from New York. The diddley bow is a single-string instrument, usually a piece of wire stretched between two screws. Players pluck the wire and vary the pitch by using a metal or glass slide. It was the first "instrument" for a lot of Delta bluesmen before they could afford a "proper" guitar. For this jam, Chikan and Slim have gotten their hands on custom electric diddley bos. Unfortunately, the jam never really develops or takes flight to anywhere. This is another song you probably only listen to once. Okiesippi Blues has its charms but there aren't enough songs or performances to make this vital or essential listening and there are some real odd turns that keep it from being that much fun. This inspired pairing succeeds only in pulling Watermelon Slim back from the ham-fisted country dalliances and returning him to the blues. On that level, Okiesippi is welcome but it still doesn't add up to enough.